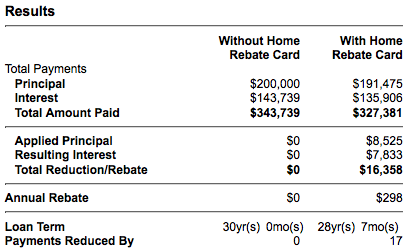 Is the Wells Fargo Home Rebate Card a Good Deal? Last week, Wells Fargo boasted about its homeowners collectively receiving $50 million in mortgage principal reduction via the Wells Fargo Home Rebate Card Rewards Program since its launch back in 2007. While that sounds pretty nifty, is the program just another marketing gimmick, or does it actually deliver? Let’s dig into the details to find out. From there, each purchase made using the card earns a 1% rebate, which is credited to the principal balance on your Wells Fargo mortgage in $25 increments. In other words, once you spend $2,500 with the credit card, you’ll earn a $25 rebate, which will be applied to your outstanding mortgage balance. For example, if you have a 30-year fixed mortgage with a $200,000 loan amount, and you spend $2,500 per month on the card, Wells Fargo would apply $8,525 toward your principal balance over the life of the loan. That would save you $7,833 in interest for a total savings of $16,358 (shorter amortization period). It would also reduce your loan term from 30 years to 28 years and seven months, meaning you’d own your home free and clear just a little bit sooner. And all of this would be accomplished automatically, with no fees or work required on your end to take part. Additionally, Wells Fargo Home Rebate cardholders can earn 3% back on gas, grocery, and drugstore purchases during the first six months. Note: Several types of mortgages are not eligible, including commercial first mortgages, certain second mortgages, farm loans, piggyback mortgages, and loans in process that are not yet funded. There are pros and cons to the Wells Fargo Home Rebate Card, like any other special offer out there. The first negative is that it requires opening a credit card, which is essentially an invitation for more debt alongside your behemoth mortgage. This is all good and well if you already use a credit card for most purchases, but it could land an irresponsible spender in even more debt. Secondly, the rebate earned via this program is only 1% – many cash-back credit cards these days come with higher rebate levels, with some offering 5% in certain categories quarterly, or 2-3% year-round. In other words, you could technically just take the cash back earned via your other credit cards and apply it to the principal of your Wells Fargo mortgage, or any other mortgage you happen to pay. Or you could always just make extra payments to principal yourself or make biweekly mortgage payments instead. Finally, deep in the terms and conditions of the program, Wells Fargo notes that your mortgage won’t be eligible if they sell your mortgage to another company. And worse, they can shelf the program at their discretion, at any time. Now neither of those things may happen, but it’s still something to keep in mind when debating about going with the card. On the flip side, the Home Rebate Card is automated, so you won’t have to worry about a lack of discipline in making extra payments to principal. As long as you use the card enough, the extra principal payments will be made, and your mortgage will cost you less over time. Is the incentive enough to go with a Wells Fargo mortgage? Probably not, but if all else is equal (e.g. same mortgage rate and fees), it could tip the deal in the bank’s favor. And if you already have a Wells Fargo mortgage, which many Americans do, it’s something worth considering if you do most of your spending with a credit card. I just take the cash back from my other credit cards and apply it toward principal from time to time. I get up to 6% cash back on certain cards, so it makes more sense that way. I think it’s a good deal. It forces the cardholder to actually pay down their principal with the cash back. Self-discipline is always going to be the biggest issue, and this offer eliminates that concern. I agree with Janelle…I’d rather have control over my cash back. It may not always make sense to apply it to the mortgage, but for those who want to pay down their loan, and lack self-control, this is a good idea. I don’t know if opening a credit card when you’ve already got existing debt like a mortgage is the best idea, but if you must use a credit card, you might as well get something in return. If you pay biweekly, Wells Fargo takes the money out of your bank account and puts it in theirs, holds the money until your mortgage payment is due, then applies in on that date. Yes, they are legally stealing from you. It’s not advised to let them. They just canceled mine because I “used it too much.” Seriously?!?! I’ve heard of credit card issuers shutting down accounts when they feel their rewards program is being abused, but this is often a pretty subjective assertion.